Vernon Silver reported on Friday for Businessweek on the Gaza Apollo. The Bronze was found in remarkably good condition in shallow waters off the Gaza strip, just north of the Egyptian border. Silver is an archaeologist who wrote a terrific account of the Euphronios Krater in 2010 called “The Lost Chalice“. He’s done some excellent reporting on this Bronze. We learn a Palestinian fisherman, Jouda Ghurab, found the statue while diving with a net last August. Silver reports that with the help of his brother and other men, they were able with some difficulty to bring the Bronze ashore. Ghurab dove down with the rope and tied it to the statue’s neck. Using the boat, they managed to right the statue. They tied another line around its base and tried to lift it so they could tow it to shore. Instead, they nearly sank the boat. Finally, Ghurab and another diver were able to turn the statue, sliding it head over foot, and foot over head, spinning it along the sea bottom until it reached the beach. They finished around 4:30 p.m., almost five hours after Ghurab had discovered the prize. It took six of them to lift the bronze onto a donkey cart. They took it to a nearby cluster of buildings Ghurab shares with other family members. Among the structures is a hut with a sand floor, a roof of palm fronds, and a wall made from a plastic banner picturing Sheikh Ahmed Yassin, the spiritual leader of Hamas, whom Israel assassinated using Hellfire missiles in 2004. The men placed the statue on the floor of a house in the compound, unaware they had discovered what might be the most valuable archaeological find of the century. Soon, though, things would get very complicated. After all, it is Gaza. It does not sound like much of the archaeology was recovered or even considered. Jawdat Khoudary, “an antiquities collector who makes his money in construction” was asked to find a buyer for the Bronze. Yet conservation is essential. A Bronze which has been preserved by the ocean for so long needs expert care, and time is extremely precious during the early moments of discovery. Bauzou at the Université d’Orléans was one of the experts Khoudary called. The French archaeologist corresponded with the Gaza Ministry of Tourism and Antiquities, using photographs to assess the bronze. “This statue is a major discovery,” he wrote in a Sept. 23 letter in which he expressed alarm over the work’s conservation. “I do not like the light green spots visible on the pictures … it is an emergency!” He said specialists in metal preservation and restoration needed to be called in at once to decide how to proceed. The transition from the dark color seen by the fisherman to the new green hue might be a sign of a type of corrosion akin to a grave dermatological condition. Bauzou concluded from his research that the statue dated from between the 5th century B.C. and 2nd century A.D. “The Apollo of Gaza is exceptional because it is the only classical Greek bronze life-size statue found in the whole Middle East,” he wrote in another report, dated Oct. 4. Silver notes of course that one of the difficulties plaguing the Bronze is the uneasy position that the Hamas government finds itself in. It is not an independent state yet, and has yet to be recognized by many foreign governments. Given that our current system of cultural heritage laws are predicated on state ownership and regulation, the Gaza Apollo is an uneasy case which stands in a gap in heritage law. A fact that some have speculated is quite convenient for the current possessors of the Bronze, and has led to speculation that the Bronze may have been discovered elsewhere and taken to Gaza. The surprising thing, as Silver points out, is that the statue shows little evidence that it was submerged in the sea for centuries. Is the reported find-spot a blind to distract the authorities from a ‘productive’ site? Yet Silver’s reporting would seem to preclude that possibility. Silver, Vernon. 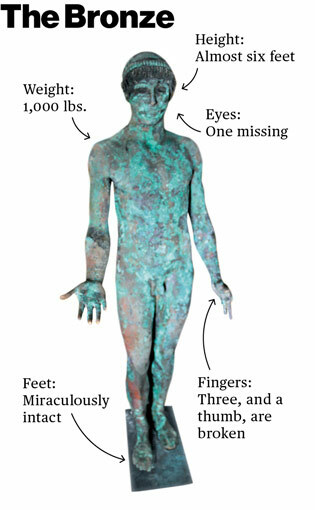 “The Apollo of Gaza: Hamas’s Ancient Bronze Statue.” BusinessWeek: Global_economics, January 30, 2014. http://www.businessweek.com/articles/2014-01-30/hamass-ancient-bronze-statue-the-apollo-of-gaza.